Dr. Charles Brown is the Chief of Sports Medicine at the Brigham and Women’s Hospital in Boston, MA. Globally renowned for his work on the human knee, Dr. Brown also serves as Clinical Instructor in Orthopaedic Surgery at Harvard Medical School. As the co-inventor of FasT-Fix, Smith & Nephew Endoscopy’s latest knee technology, Dr. Brown worked to develop an effective way to suture together tears in the meniscus, the thin pad of cartilage that cushions the knee. Many orthopedic specialists believe that the adoption of FasT-Fix may lead to shorter surgeries as well as shorter recovery times for meniscal repair patients. Dr. Brown has lectured around the world, delivering speeches about the knee in such far locations as Kuwait, Western Australia, and Venezuela. He has also specialized in women’s sports medicine, and was voted the top doctor in Boston by Boston Magazine. Knee1: What does the meniscus do? The menisci are fibrocartilaginous C-shaped discs that cover the outer two thirds of the surfaces of the medial and lateral tibial plateau. The outer peripheral edge of each meniscus tapers to a thin, free inner edge resulting in a triangular cross section. The meniscus has five major functions: load bearding, shock absorption, joint stability, joint lubrication, and proprioception. The meniscus plays a vital role in load transmission across the knee joint. Approximately 50 percent of the compressive load of the knee joint is transmitted through the meniscus when the knee is fully extended, and 85 percent when the knee is bent 90 degrees. The shape of the meniscus creates a more congruent surface for the articulating round femoral condyles and the flat tibial plateau. Loads are, therefore, transmitted or dissipated over a larger surface area. The shock absorption function of the meniscus is due to its viscoelastic properties, which dampen loads during impact. Because of its triangular shape, the posterior horn of the medial meniscus acts as a “door stop” and plays and important role in limiting anterior translation of the tibia in knees that have a torn anterior cruciate ligament. The shape of the meniscus creates a more congruent surface for the articulating round femoral condyles and the flat tibial plateau, thus enhancing joint conformity. This conformity promotes the hydrodynamic action required for fluid lubrication of the joint. Finally, nerve endings present in the meniscus provide sensory input to the central nervous system, and thus the meniscus plays a critical role in joint position sense (proprioception). Knee1: How is the meniscus torn? The most common mechanism of meniscal injury is a twisting injury with foot anchored to the ground or floor. 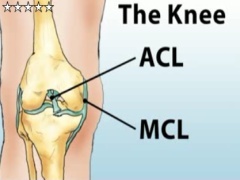 The meniscus is also commonly injured in conjunction with the anterior cruciate ligament. The most common mechanism of ACL injury is a non-contact, deceleration, twisting injury or a hyperextension injury. Knee1: What are the signs and symptoms of a meniscus tear? The most common symptoms of a meniscal tear are pain and joint swelling. The pain is localized along the medial or lateral joint line, and is commonly aggravated by squatting running, jumping, twisting or turning. Other symptoms include looking or catching, and buckling. Common signs of a meniscal tear are swelling, and loss of motion especially extension. Knee1: How are meniscal tears diagnosed? Diagnosis of a meniscal tear in most cases can be made by history and physical examination of the knee. On examination, the most important signs of a meniscal tear are joint line tenderness and joint swelling. Although there are many provocative tests that an examiner can perform to diagnosis a meniscal tear, none can be considered definitive, and a negative result does not preclude the patient having a torn meniscus. Meniscal tears can also be diagnosed by an MRI scan. Numerous studies have shown MRI imaging to have an accuracy of over 90 percent when interpreted by an experienced radiologist. However, there can be false positive and false negative MRI’s, so the MRI findings must be correlated with the patient’s history and the results of the physical examination. Knee1: How is a meniscus tear treated? The treatment of meniscal tears varies depending on the severity of the patient’s symptoms. For example, a small degenerative tear in a relatively sedentary or older individual would probably initially be treated without surgery. On the other hand, a young or active individual with a large meniscus tear, which causes severe pain and locking, would probably require surgery on a more urgent basis. The majority of meniscal tears fall somewhere between these two extremes, and the decision to proceed with surgery is based on how disabling the patient’s symptoms are. Knee1: What are the surgical options for treating a torn meniscus? The principle of surgical management of meniscal tears has changed dramatically over the last 20 years. It was originally though that the meniscus much like the appendix was of little use, and total meniscectomy was the standard of care. Recognition of the importance of the meniscus to the normal function of the knee has now led to the concept of preserving as much of the meniscus as possible. In the 1970’s the late Dr. Robert Metcalf pioneered techniques of arthroscopic partial meniscectomy as an alternative to removing the entire meniscus. Finally, in the 1980’s techniques of arthroscopic meniscal repair were pioneered by the late Dr. Charles Henning. Knee1: How is the meniscus repaired? Three are three methods of repairing the meniscus. The oldest and still considered by many to be the “gold standard” for meniscus repair and is the inside-out suture technique. As mentioned earlier, this technique was pioneered by the late Dr. Charles Henning. In this technique a cannula is used to place vertical or horizontal sutures across the tear. An incision on the medial or lateral side of the knee is required to protect the nearby neurovascular structures and to retrieve the sutures. The advantage of the inside-out technique is that it allows the surgeon to place sutures on the superior and inferior surfaces of the meniscus. Biomechanical studies have also shown that vertically oriented sutures placed using this technique to be the strongest method to repair a meniscus. The disadvantage of this technique is that it requires an additional skin incision to be made, and it requires the presence of a trained assistant to pass, retrieve, and tie the sutures. Another method to repair the meniscus is called the outside-in technique. In this technique, a long thin needle is passed through the skin and across the tear. A suture is then passed through the opening in the needle and pulled out of the knee through the arthroscopic portal. A large bulky knot is then tied on the end of suture. A second suture is passed across the tear, retrieved and tied. Both sutures are pulled back into the joint and tied on the capsule of the knee joint. The bulky knot proved a buttress that pulls the edges of the tear together. The advantage of the outside-in technique is that it requires no special instrumentation. One of the main disadvantages of this technique is that it can sometimes be difficult to place the needles exactly where one wants. Finally, there are all-inside techniques which can be performed arthroscopically without the need to make any skin incisions. The all-inside technique is commonly performed using Meniscal Arrows or other fixators. Knee1: You are the co-inventor of Smith & Nephew Endoscopy’s latest knee implant for meniscal repair, the FasT-Fix. How did you come to be involved with the project, and can you explain how it works? I was involved with the development of the predecessor of the FasT-Fix which was called the T-Fix. The T-Fix was introduced in 1993 and was one of the first all-inside meniscal repair implants introduced to the market. One of the major disadvantages of the T-Fix was that it required the surgeon to tie knots arthroscopically, which can be quite challenging. Our goals in developing the FasT-Fix were to create a safe, simple, all-inside arthroscopic technique using a non-absorbable suture implant that would allow placement of both vertical and horizontal mattress sutures without the need to tie arthroscopic knots. Each FasT-Fix implant contains two 5-mm plastic suture bar anchors with a pre-lied self-sliding knot. The plastic suture bar anchors are placed into the meniscus across the tear using a spinal needle and anchored on the capsule. The self-sliding knot is then pulled and tightened creating a vertical or horizontal loop of suture. Knee1: What is the advantage of FasT-Fix over Meniscal Arrows or other meniscal fixators? The FasT-Fix allows the surgeon to repair the meniscus using vertical or horizontal mattress sutures. In essence, the FasT-Fix allows the surgeon to perform a repair similar to the inside-out technique without the need to make an additional skin incision. Biomechanical studies on human cadaveric menisci performed at the University of Kentucky by Dr. David Caborn, have shown that a FasT-Fix vertical oriented suture had the same strength as an inside-out vertical mattress. The FasT-Fix and inside-out vertical mattress sutures had identical strength and both were approximately twice as strong as 13-mm Meniscal Arrows. The FasT-Fix and vertical mattress sutures did not break after being cycled 500 times. However, the Meniscal Arrows failed after less than 25 cycles. Similar to the inside-out technique, the FasT-Fix can easily be placed on the superior or inferior surfaces of the meniscus. Abrasion of the articular cartilage on the femoral condyles has been reported with the use of Meniscal Arrows and other fixators. However, since there are no rigid implants to sit on the surface of the meniscus, abrasion should be minimal with the FasT-Fix technique. Knee1: What type of tear is ideal for repair with the FasT-Fix? The ideal type of tear for the FasT-Fix is a longitudinal tear in the outer one-third of the posterior and middle third of the meniscus. Knee1: How do approaches to the knee differ around the world? There is little difference in the basic approach to treating knee injuries around the world. The importance of the ACL in terms of preventing giving-way episodes of the knee during athletic activities is almost universally recognized around the globe. Similarly, the importance of preserving the meniscus is universally recognized. Differences in treatment particularly in Third World countries occur mainly due to the lack of affordable access to medical care. As a result there are often long delays in diagnosis and treatment. Additionally, many hospitals lack the ability to purchase the necessary equipment to perform arthroscopy, meniscal and knee ligament surgery. Surgeon education in the use of the sophisticated techniques can be a limited factor in some parts of the world. For the last 12 years, I have been traveling around the world participating in knee training courses where surgeons can learn these demanding techniques by practicing on plastic knee models or more recently, human cadaveric specimens. Many of these courses have been organized and sponsored by Smith & Nephew Endoscopy. Knee1: How can one avoid knee injuries? Knee pain/injuries result from two basic mechanisms: single impact macrotrauma and repetitive microtrauma (overuse). It has been estimated that single impact macrotrauma accounts for 25 to 40 percent of all knee injuries, while repetitive microtrauma accounts for 60 to 75 percent. Single macrotrauma commonly results in strains (injury to a muscle-tendon unit), sprains (injury to a ligament or joint capsule), contusions, abrasions, lacerations, dislocations, and fractures. Repetitive microtrauma or overuse commonly results in tendonitis, bursitis, stress fractures, friction syndromes, and anterior knee pain. Overuse injuries occur when the cumulative repetitive forces are greater than a specific tissue is able to withstand. The knee is a common site for overuse injuries because it is located at the end of the two largest bones in the body and is subjected to large external torques which generate high internal forces, and also because it plays a critical role in force transmission in the lower extremity. For example, it has been estimated that a marathon runner takes an average of 25,000 steps during a race, and with each step the lower extremity may be subjected to a ground-reaction force that is several times body weight. Knee injuries are caused by intrinsic and extrinsic factors. Intrinsic factors include: lower extremity alignment, muscle weakness, lack of flexibility, overweight, and unfortunately female gender. Correction of intrinsic factors can be achieved by weight reduction, muscle strengthening, stretching, and correction of lower extremity alignment issues such as leg length differences by a heel lift and flat feet by the use of shoe inserts (orthotics). Extrinsic factors include: errors in training, poor equipment, ineffective rules, excessive loads on the body, and the playing field or surface. The best way to prevent knee injuries is to avoid overtraining, use proper equipment, maintain your ideal body weight, keep your muscles strong and flexible, and to correct any lower limb alignment problems such as flat fee or leg strength discrepancies. Knee1: How has our approach to women’s sports injuries changed in the last 10 years? Title IX of the United States Educational Assistance Act was enacted in 1972. This law required that institutions that receive federal funds provide equal access for women to fund extracurricular activities. This federal law led to a significant increase in the number of females participating in sports at the junior high, high school, college, and professional levels. Unfortunately, this increased participation of women in sports has led to a dramatic increase in the incidence of knee injuries in females. Females participating in jumping, cutting sports demonstrate a four- to six-fold higher incidence of non-contact knee injuries compared to males participating in the same sports. So one of the major areas of change has been the recognition that women are more susceptible to knee injuries. This knee injury “epidemic” in women has also generated much research to try to answer the question why women are more susceptible, and also to try to develop injury prevention programs. You recently featured Dr. Frank Noyes and he discussed his thoughts on why women are particularly susceptible, and he also talked about the work his group is performing in the area of injury prevention.